I was baking for two birthday boys this weekend, one with a gluten intolerance. I started with my favorite chocolate cake recipe which has much less flour than the typical recipe – I wanted there to be no discernible difference between the gluten-free and gluten-full versions. From there I decided on a salted caramel frosting – firstly because I have been dreaming of it since I tasted Trilly’s a few weeks ago – secondly given salted caramel is all the rage in San Francisco since B-Rite opened their creamery, it would surely be a crowd-pleaser and thirdly since I would end up with a masculine colored, latte-brown frosting, it would be perfect for a man’s birthday celebration. As for the cake, I didn’t want to just do the gluten-free version. I did both side by side so I could compare the two. The gluten-free version did shrink a bit more and pulled from the sides of the paper. The biggest difference was this and the way they looked, but a side by side tasting showed very little difference between the two. I deconstructed the frosting in my mind and thought I had a pretty good idea what the recipe was, but I called Trilly just to make sure I was on the right track. I was on the right track and got a couple of tips along the way. I went ahead and crafted a recipe. I can’t say if it came out exactly the same, but it did come out freaking tasty. Yum. I highly recommend the frosting. The caramel is very noticeable and the cream cheese adds just a bit of tang to balance the sweetness. The salt lies low flavor-wise and simply intensifies the richness of the caramel. The cupcakes went over quite well. I recommend them if you are looking to satisfy a room full of adults. 4. Measure out the regular flour, 2 tablespoons cocoa, 3/4 teaspoon baking powder, and 1/8 teaspoon salt into a small bowl. 5. Measure out the gluten-free flour, 2 tablespoons cocoa, 3/4 teaspoon baking powder, 1/8 teaspoon salt, and the xanthan gum into a different small bowl. Keep track of the gluten-free bowl and be extra sure to not get any regular flour in the mixture. 6. Transfer the cooled chocolate/butter mixture to the electric mixer and beat for 3 minutes. 7. Add one egg at a time, mixing for 10 seconds between each. 8. Scrape the bowl and separate into 2 batches by measuring out 2-3/4 cups of batter into a second bowl. 9. 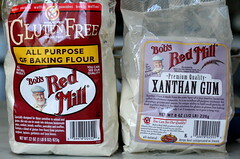 Sift the gluten-free flour into one bowl and mix to combine. Keep track of the gluten-free batch! 10. Sift the regular flour into the second bowl and mix to combine. 11. Scoop into cupcake cups only 2/3s full. I put parchment under the gluten-free cupcakes so I wouldn’t lose track of them. Bake all the cupcakes at 350 F for 25 minutes or until a toothpick comes out clean. If you are using cupcake papers, use a different color for the gluten-free. 8. Stir the mixture, again being careful. Add the butter, lemon juice, and salt. Stir until combined. 9. Measure 1 cup into a Pyrex measuring cup. Stirring occasionally, allow to cool until thick like molasses and warm to the touch, about 20 minutes. Note: There was a small bit of extra caramel that I poured onto a small plate that I covered in aluminum foil and greased with vegetable oil. I transferred the plate to the freezer for about 30 minutes. I chopped the caramel quickly into squares (its starts to get soft) and topped each cupcake with a square. 3. Sift 3 cups of powdered sugar into the butter/cream cheese mixture and beat to combine. 4. Add 1 cup of the salted caramel and beat to combine. 5. Sift 2-3 cups of powder sugar, in 1 cup increments and beating between each, until you arrive at the thickness and sweetness you desire. I used 6 cups. The frosting wasn’t super thick, but it was starting to get pretty sweet. 1. Frost cooled cupcakes with a generous amount of frosting. 2. Sprinkle each cupcake with sea or kosher salt. I ground some rock sea salt onto each. 3. Top with a caramel candy, homemade or otherwise. I love the way your cupcakes look and I am ready to try the truffle recipe. I was wondering how you get the cupcake to come out perfect looking and not spill over the top and not be too low so the top can’t be seen. Is there a science to how much batter you put in each cup and do you let the cups stand alone in the oven or are they in some sort of cupcake tray? Thanks for your blog. I love it! It depends on the recipe but in this case I fill the papers with exactly what fits in a 2 ounce ice cream scoop. The papers are sturdy enough to sit alone on a sheet pan. A good friend just asked if I would make some gluten free cupcakes. These look great! I may have to give it a go. YUM! Nothing better than chocolate and caramel. I have attempted caramel frosting a few times now with so-so results. Ill give this one a go. Thanks! In trying to understand how xanthan gum is actually used I couldn’t find where you used it? Was it just added to the gluten-free flour mix at the beginning? Oops, that’s exactly where I add it. Sorry, I fixed up the recipe. Xantham Gum is a binder it works wonders in baking, sauces, breads… the secret is know how much to use… if you use to much the product will come out gummy. I’m a little confused at how this yielded 26 cupcakes. Is this your favorite chocolate cupcake recipe only doubled, one set with xanthum gum/gluten-free flour and the other just regular? Becuase it seems like everything is doubled but then the flour is cut in half…? I have a friend with celiac and want to send her this recipe but I’m a bit confused. Is it an either/or thing with the flour? Just substitute gf flour in equal parts? Do you use xanthum gum in both or just the gf? Love love love your cupcakes. Wow! I just made the flour version, and they were fabulous! I’ve never liked caramel flavored things because they tend to be too sweet for me, but since I was in control of the sugar content, these came out perfectly. Thank you so much. I made them for a spinning (yarn) party, and they were a huge hit — even with the children! So, I tried this out (with the flour version) + a bunch of little tweaks and it is hand down the most delicious thing I’ve ever made. Thanks so much for inspiring me to try a salted caramel frosting! I wouldn’t have been brave enough to try it without looking at your recipe. I made the chocolate/ganache/mint cupcakes at the same time, and like always, your recipes turned out awesome. where do you get those cupcake cups? I love them. Wow! I just realized how to post a comment on your site! Woot! That made my day! Oh duh, okay, I totally get it now. I’m just silly. Joy! 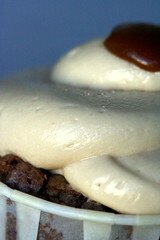 I was just thinking of a cream cheese frosting to use my dulce de leche in- bingo! Would the caramel still turn out with brown sugar (or a mix of brown sugar and reg. sugar) instead of just regular sugar? it seems like it would. is there something i’m overlooking that might make this a bad choice? Oh, these sound awesome! I can’t wait to try them, though I admit I’m a little confused by the gluten/not-gluten proportions…if I want to make gluten-full cupcakes, I think I just use more flour, yes? I read your blog on a regular basis and always send out the corresponding post to friends whenever I have them try the cupcakes. Recently a co-worker narrowed down an allergy (of sorts) to gluten and has been living gluten-free. Apparently I’ve been torturing her with everything I bring into the office. So, she she jumped onto your site and found this recipe. I’ve been barred from bringing something in unless it’s gluten-free on the next round so I’m excited to try these! I think if you like a big dinner and a little dessert then tjis recipe is for you!but if you like a fancy dessert after your dinner then i would not try this recipe! but try a devils food cake or something franch!!! how do you avoid the gummy texture in some gf cakes. I have made the salted caramel frosting twice now – though I used it on a different chocolate cupcake recipe. Both times the frosting came out amazing and I got many compliments! Most recently, I made a small batch of cupcakes so I had leftover caramel and frosting so I made a small batch of cinnamon rolls and put the caramel on the bottom of the pan and frosted with the caramel frosting. It was delicious. I love your site, though my cupcakes are never as beautiful as yours, I’m working on it. These look delicious. It’s so true that salted caramel is all the thing in the city, but it’s also that way in Portland and places like that. I’ve never been a cake person, but cupcakes are just so whimsical, and these salted caramel ones are a perfect way to grow-up cupcakes (which, in any case, are very popular right now). Thank you so much!! After 2 attempts without the xanthan gum (hard to find in Berlin), I finally ordered some online and wow… These were, hands down, the BEST gluten free anything that I´ve made in a long time. And I do a lot of baking! Thanks for sharing. I made these tonight and the trick to the frosting is blend the caramel in before any of the sugar. After you cream the butter and cream cheese it holds together wonderfully. I also used 8 ounces cream cheese and only one stick of butter! Great cupcakes, but the icing is SUPER sweet and I only used four cups of powdered sugar. I would recommend cutting the butter cream with more butter and cream cheese and less sugar since the sugar thins the icing and makes it runny. Otherwise, they are yummy. 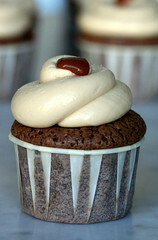 I used the Barefoot Contessa’s recipe for the cupcakes…they had coffee in them and that gave everything an extra kick. Thanks so much for your recipes! I have made the dark chocolate cupcakes twice now and this time, I used the salted caramel frosting. They were delicious and everyone raved. Can’t wait to try more! I am on gluten free diet too, thanks for sharing the cupcake recipe. Absolutely loved the recipe! tried it with hazelnut meal instead of the gluten free flower which resulted in an amazingly moist cupcake and added flavour as well! Thanks! This is probably a silly question, but do 8 eggs go in each of the batch, or do we split all of the ingredients,including the butter and sugar in half??? I wonder if anyone has ever made a fudge from your salted caramel recipe…Have you ever tried one? Hiya! do you think you could make a “gluten-free” tag for your cupcakes. I don’t work so well with gluten, and this recipe made for joy! ^.^ a section would help me sort through your cupcakes! I’ve been sifting through your cupcakes, and it’s hard to figure out which would taste good replaced with a rice-flour or something, and which are already gluten-free. I’m new to the gluten-free scene, and I’d really like it if you could do that. Love your cupcakes! Any cupcakes recommendations to turn “gluten-free”? I’m really confused. How is this gluten free if it has both all purpose flour AND glluten free flour? is that an either or option? I want to give these a whirl. Can you please explain!? Ok. I think I’ve figured it out. If I don’t want to do any regular ones, I just double the gluten free flour correct? Thanks! These look delicious! I haven’t tried them out yet, but can’t wait!